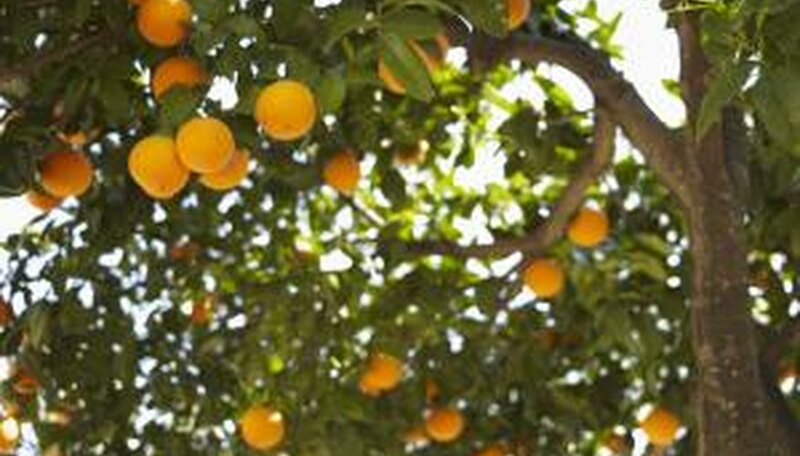 Homegrown citrus trees perfume the yard and enhance the landscape with their colorful fruits. Citrus trees have very specialized site, cultural and environmental requirements. They are tropical to sub-tropical and variances in the temperatures can cause injury to the plant. Citrus trees that have all their requirements met are still susceptible to a high number of insect pests, viral and fungal diseases and nutrient deficiencies that can cause bark deformities, peeling and scaling. Identification of the cause of bark problems is the first step to curing the issue. Flick off some of the bark where it is disfigured with a knife. If the wood is discolored in irregular dark patches under the bark, the plant has citrus ringspot virus. The absence of patchiness under the bark may indicate Psorosis, which comes from may viruses and causes scaly bark. Disinfect a knife with a solution of 10-percent bleach and 90-percent water and make a slender slice into the bark. If the wood is soft and stained a dark brown the tree may have foot rot. This is a fungal disease that begins at the bud union and can girdle the tree. Examine the under side of a piece of bark or the cracked margins with a magnifying glass. If you see small black, red, orange or yellow fruiting bodies the plant has any one of a number of fungal diseases. You can narrow it down by looking for the color of the fungus. Check for gummy residue or open oozing areas in the bark or the wood under the bark. This would indicate gummosis or Armillaria root rot. Armillaria will have large white cottony masses of mycelium growing under the bark. Take a piece of bark and shaving of wood in a glass jar to a laboratory or county extension center for identification. The shear number of fungal and viral diseases that could infect a citrus tree are vast. You can rule some diseases out if your tree has a resistant rootstock but you need to know what rootstock it was grafted onto.